Japanese Calligraphy is all about movement and movement simply cannot be taught in a book. This is why we offer our unique courses on CD-ROM. Each CD in the series shows detailed explanations, stroke order, and frame by frame analysis and there are over thirty videos showing proper technique for brushing the character. Along with the correct way to brush the character, student samples and videos are also shown with corrections and explanations. By showing both right and wrong technique one learns what is correct and how to fix what is not. This CD work on Microsoft Windows, Mac and Linux and all major browsers include Internet Explorer, Chrome, and Firefox. This set contains CD01, CD02, CD03, and CD04. This is the first section of the Takase Shodokai Learn Japanese Calligraphy Series. 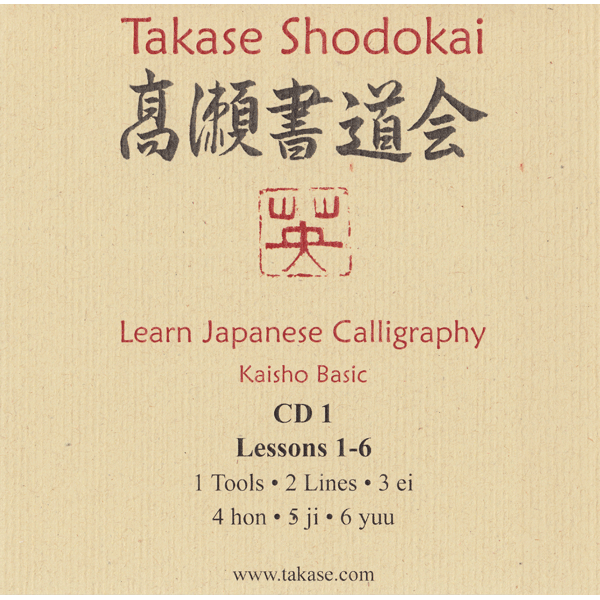 This section introduces Japanese Calligraphy using the kaisho (Block) font. Kaisho is probably the most commonly seen Japanese font today and is noted as being bold and powerful with precise and crisp lines. By the end of this section the student will have a good understanding of the tools used in Japanese calligraphy along with their usage and care. 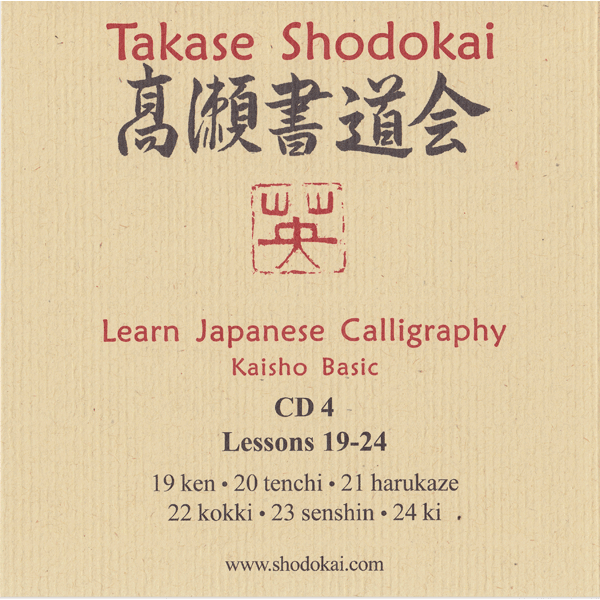 The student will also have a solid introduction to the basic strokes and lines that comprise the kaisho font. In this first lesson, we discuss the tools required for Japanese Calligraphy. We discuss what to look for when purchasing tools and their proper care. Finally, we discuss their usage including how to hold the brush and how to prepare the ink. In this lesson we concentrate on basic lines where we cover the three basic styles each of yokoga (horizontal lines), tatega (vertical lines) and tensetsu (compound lines). This lesson focuses on the eight basic strokes of kaisho calligraphy using the kanji for Eternity which is ei in Japanese. ten, migihane, tatega, and tategahane. In this lesson we focus on the two harai strokes and on drawing yokoga (horizontal lines) which will cleanly bisect the tatega (vertical line). In this lesson we focus on ten, tatega, yokoga, and tensetsu. Finally we focus on the character yuu 由 concentrating again on the tatega and tensetsu. This character combined with ji 自 from the previous lesson gives us the word jiyuu 自由 meaning Freedom or Liberty. This is the second section of the Takase Shodokai Japanese Calligraphy Series. Here we continue to focus on the basic strokes of the kaisho font. Remember that kaisho is a bold and precise style. Our emphasis in this section is to continue to practice the lines and strokes previously introduced. Lesson 7 gives us a chance to revisit the three yokoga that we first worked on in lesson 2. Tsuki gives us a chance to practice a hidaribarai along with a tensetsu that ends in a tategahane. Tsuki is a deceptively simple character that is often seen in Japanese Calligraphic works. Hana is going to give us good practice in contrasting the harai and hane strokes as there are two each in this character. Iwa gives us a chance to revisit tensetsu which has two that are in opposite directions. Tomo gives us the opportunity to practice the harai strokes. There are three in this one simple character with two hidaribarai and one migibarai. We have been practicing the harai and hane strokes in most of the characters. For this final lesson we are going to use me which is all tatega, yokoga and tensetsu. This is the third section of the Takase Shodokai Learn Japanese Calligraphy Series. In this section, we are going to continue to focus on lines and strokes. I hope that you have started to become accustomed to the strokes and that these are beginning to feel natural. Your work should be similar to or surpass, that of student 2. If your work is beginning to consistently resemble or surpass that of student 1 then you are doing well. This is the first chance that we have had to work on a shin type tatega. The other feature to concentrate on is the migihane at the bottom of the character. The two features we will concentrate on is the hidarihane and the main tategahane. This lesson gives us a chance to revisit the opposing hidaribarai and migibarai. we are going to work with kuni that gives us a large tensetsu along with smaller yokoga. The main focus is a nice balance between the hidaribarai and the long curved stroke on the right ending in a hane stroke. We end this section with sora which is a nice combination of precise tatega and yokoga along with two curved lines ending in a hane stroke. This is the fourth section of the Takase Shodokai Japanese Calligraphy Series. In this section we introduce samples with two kanji. Work on getting a nice balance between the two characters. It is also helpful to move back and forth between single character samples and two character samples. Ken is one of two characters is this session that is a single character. This will give us a chance to move back and forth between different size characters in this lesson. Concentrate on getting the lines correct, but also on planning the layout of the character. sizes of the characters in your mind before beginning. Harukaze combines both the standard three types of yokoga along with a series of harai and hane strokes. You might want to take this moment to reflect that moving from one character to two characters takes some getting used to, but you probably do not feel nervous on the last stroke of the last character. This is important to note as we increase the number of characters and we want to keep this nervousness away. Kokki is a nice combination of a complex character combined with a simple character. Keeping these well balanced is important. Senshin is an important concept in Zen which is also important to calligraphy. This character gives us a chance to practice the ten stroke and a chance to compare a hidarihane and a hidaribarai. Ki is a long and complex character. While this is a single character planning is required to get a nice balance on the page. This character is almost all tatega, yokoga, and tensetsu.